Dubai Show Jumping coach, Alice Debany Clero, joins us to share techniques she’s developed throughout her long and impressive international career. In part two of her series, Alice shows us another of her methods for producing a young horse. This time she introduces her young mare to boxes without wings for the first time. Alice takes her time to make sure her mare understands the objective. Ultimately, the proper introduction to any new exercise will ensure success and the lesson will stick for life. Equine activities can be hazardous and may subject participants to injury. 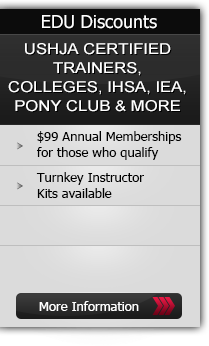 Neither Equestrian Coach, LLC nor Alice Debany Clero assume liability for your activities. This program provides general instructions and techniques that may not be suitable for everyone. No warranty is given regarding suitability of these instructions to the viewer.